DUMBARTON took two points from their first competitive match of the season in Edinburgh on Saturday. DUMBARTON took two points from their first competitive match of the season in sunny Edinburgh on Saturday. 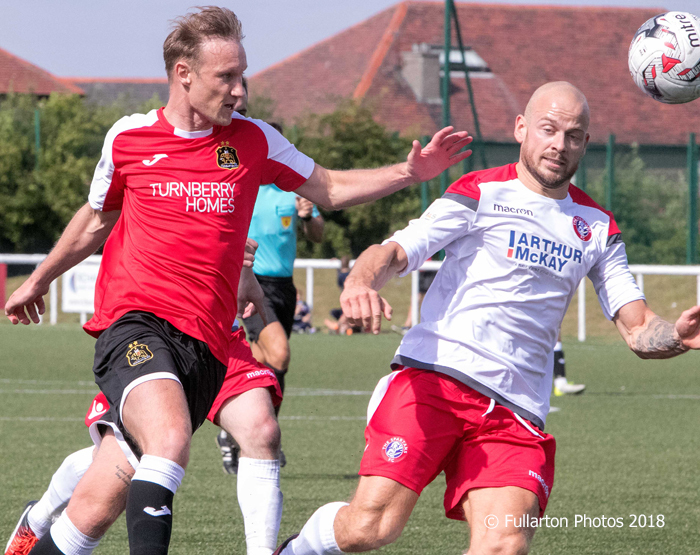 A team with only three players from last season took to the pitch at The Spartans FC ground in Pilton in their first match in the Betfred Cup Group H, wearing the new red away top and the new black home shorts. Stevie Aitken's men claimed their first two points after a goalless stalemate and a penalty shootout win against a top Lowland League side. Sons bossed the first 30 minutes, but enjoyed only half chances while protecting against counter attacks from the home side. On 21 minutes Dumbarton had the ball in the net through Iain Russell (pictured), but the assistant referee's flag was already up for offside. The stalemate continued into the second half, when Spartans, on the back foot for the duration of the first period, began to press. Sons started to thread the ball together far better as the half progressed. But there were chances at each end. Cennerazo was denied by Sons, and then new latest signing Michael Paton was off balance for one of several late opportunities for the visitors. Both sides took a point from the 0-0 draw before the tie went to penalties for an additional point. In the end it was two fine penalty saves by new keeper Grant Adam that gave Dumbarton two out of three points in their first Betfred Cup group game.